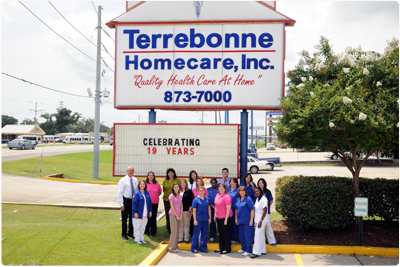 Terrebonne Homecare, Inc., is dedicated to promote the healing and rehabilitation processes for each patient in the security and comfort of his or her home. We believe to be cared for at home promotes trust, quickens recovery, and encourages health and provides for support from family and friends. Each THI employee is committed to each patient’s treatment. A treatment designed to facilitate the patient’s return to his or her community and to perform the basic functions that make each life precious and special. We at THI are committed to bring each patient back to the point of health they were before treatment and, if possible, to a point of better health. Also, to instill in each patient the knowledge and skill to manage and maintain a happy, fulfilling standard of health.